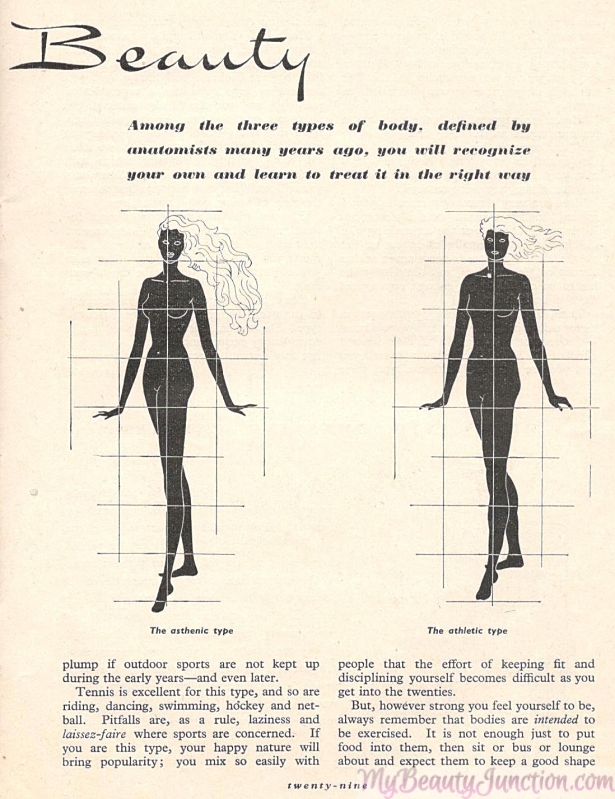 A century of beauty trends, tips, tutorials and perceptions from 1880s-1980s magazines. The word "trend" implies something modern and not 130 years old, but more on the semantics in a minute. I cannot believe it is two whole years since this blog began - I feel like a complete noob most of the time. I would like to thank everyone who has read this blog for their support and hope you have liked it here at least for an infinitesimal second, at some point... Thanks also go to ANYONE who has advised, helped and shared knowledge and posts with and for me. I have more colleagues now than I have ever had at any workplace and love that about blogging. 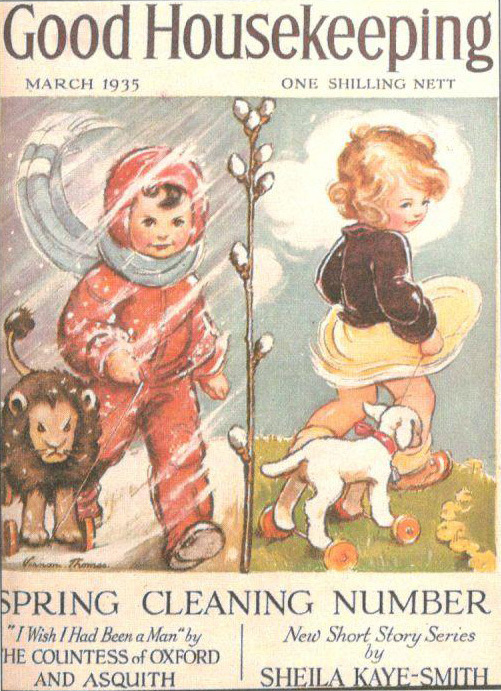 Last year, I celebrated my first blogiversary by showing you some beautiful vintage beauty advertisements - check the post here. It is my all-time favourite post. 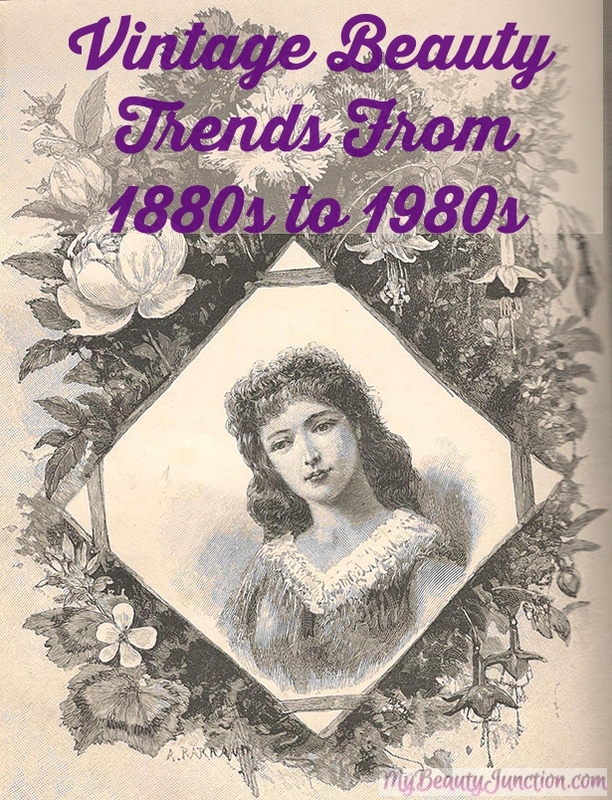 This year, I am sharing article-excerpts from women-centric magazines from the 1880s to the 1980s, containing beauty trends (i.e., whatever was trendy at the time), tips, tutorials, and perceptions. All of these are from my Gran's and Mum's collections, carefully scanned under heavy scrutiny after months of begging, bribing, pleading, coaxing and emotional blackmailing, and returned amid many mutterings. Warning: Picture-heavy. Enjoy the old-world beauty tips, tutorials and perceptions! Perceptions of beauty were completely different from what they are today. I only share the articles and neither condone nor oppose what they say, but am just an impartial antique-collecting nerd. Almost all of these are now in the public domain and are freely and widely available online. I have not fully scanned anything that could still be copyrighted (including a DC Thomson publication where I'm not sure) and have only scanned quarter-pages. 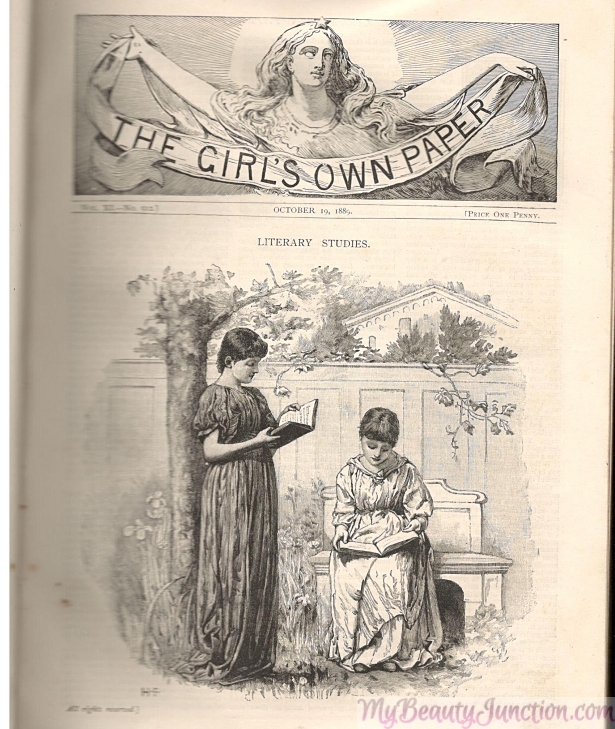 No article has been reproduced entirely and all publications mentioned are now defunct. All of them are British Commonwealth/Empire-centric/based. These are scanned and, therefore, may not always be straight, or when the page is larger than my scanner, may not contain the whole page (e.g. Good Housekeeping). All copies of the scans shown here belong to my Mum or Gran, not to me. Please click on the individual images to enlarge them. Some of the extremely foxed scans may have been colour-corrected by me for ease of reading. Sources of the scans are shown in detail towards the end of the post. 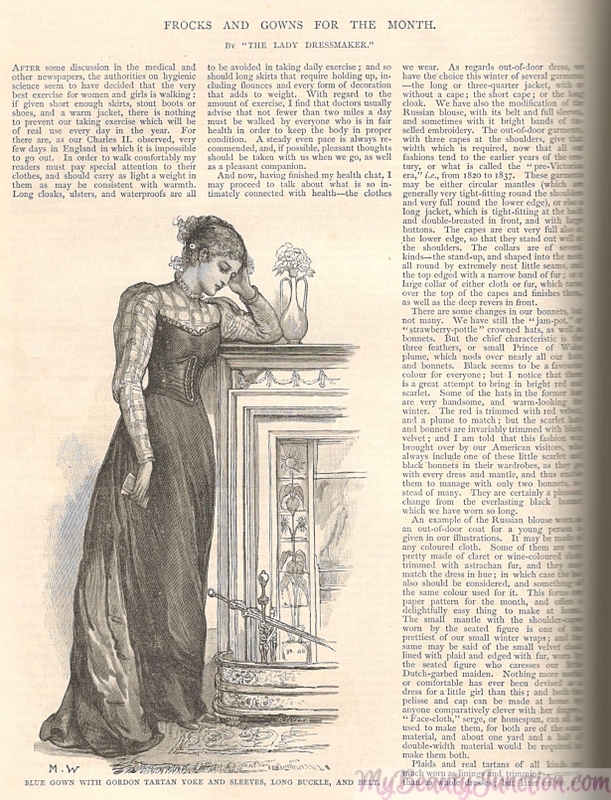 More than makeup, Victorian magazines covered fashion, which was modest (by today's standards). The articles stressed goodness, inner beauty and God's love as the best beauty tools (See slideshow further below for more). 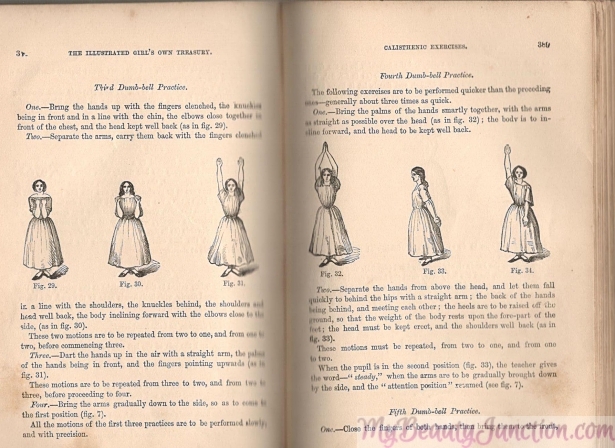 Exercise and physical fitness were prominent in a post-Boer War publication's beauty section. A decade later, magazines were beginning to acknowledge beauty products - preferably natural ones. 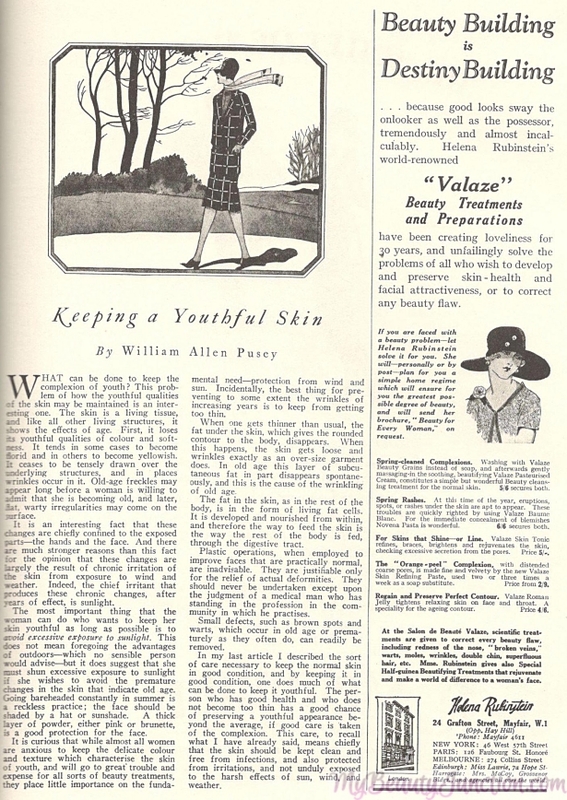 Magazines featured anti-ageing tips and Helena Rubinstein adverts for skincare products. 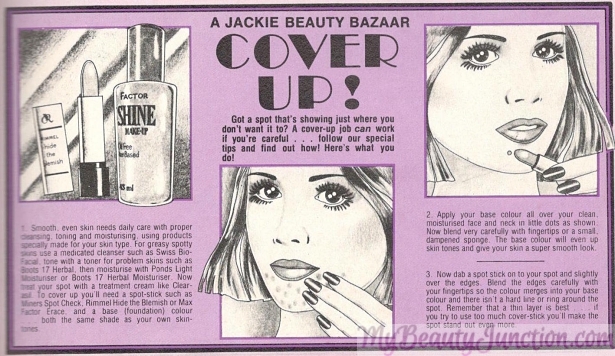 Other brands advertised at the time include Bourjois, Boots, No7 and Yardley. Check out this sister post on vintage beauty advertisements for more. 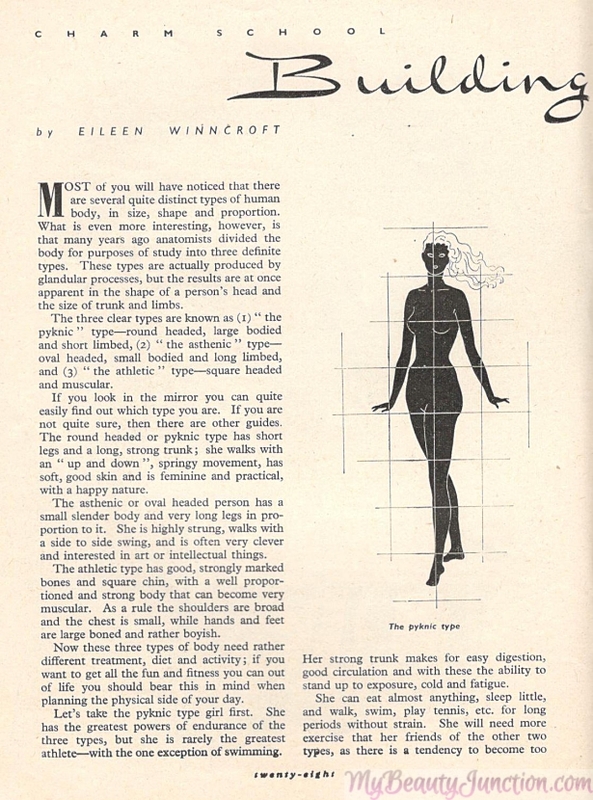 Magazines were open enough to discuss body types and tips for improving your figure, but slim was definitely in. 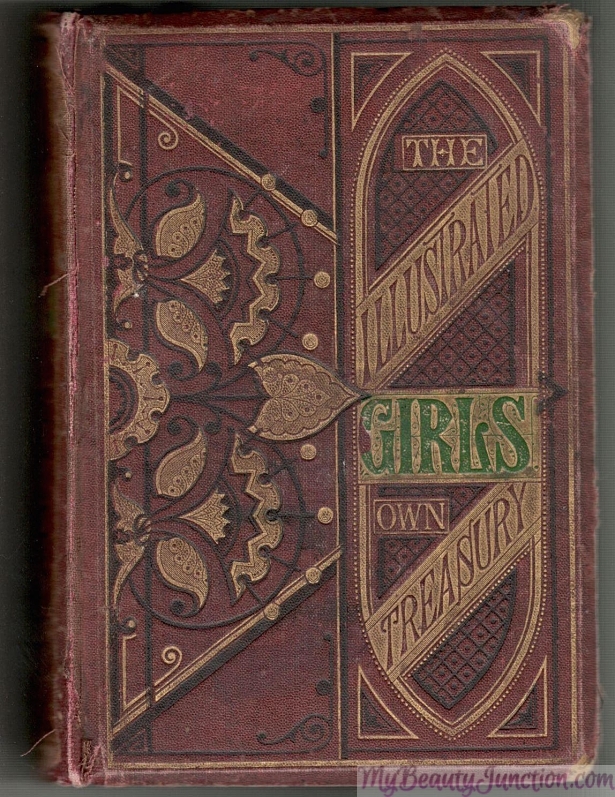 The images featured here would have scandalised Victorian readers. 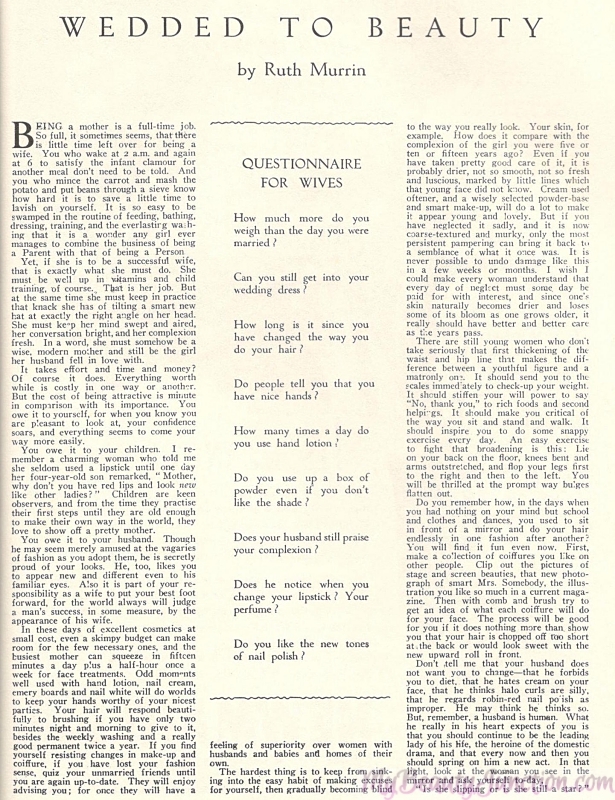 With the outbreak of WWII, focus was on making SAHMs and housewives feel good about themselves, and to improve their appearances for their husbands' and children's sake! A number of articles dealt with avoiding "matronly spread" and finding time for one's beauty and fitness regimen while running a household. 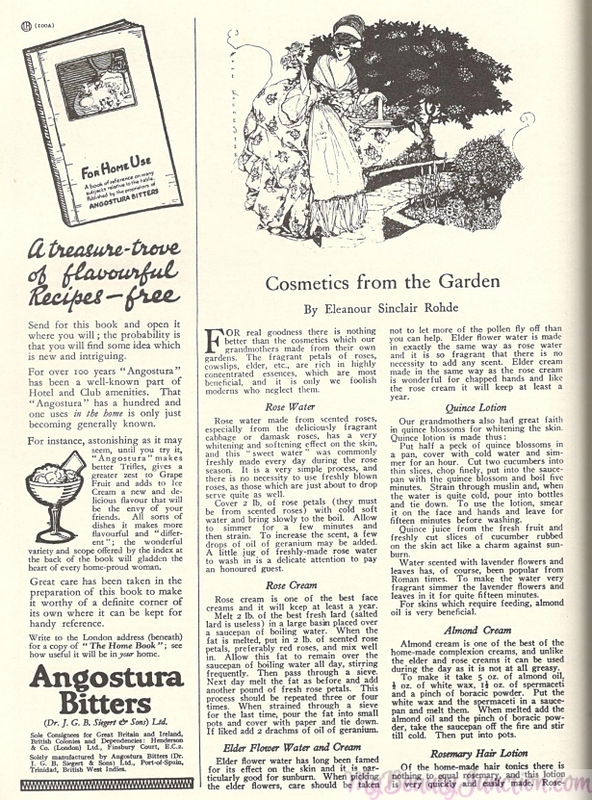 Dedicated pages for skincare and makeup products appeared in magazines, though many bordered on advertorials, naming and showcasing particular brands - Gala, Innoxa and Dorothy Gray. 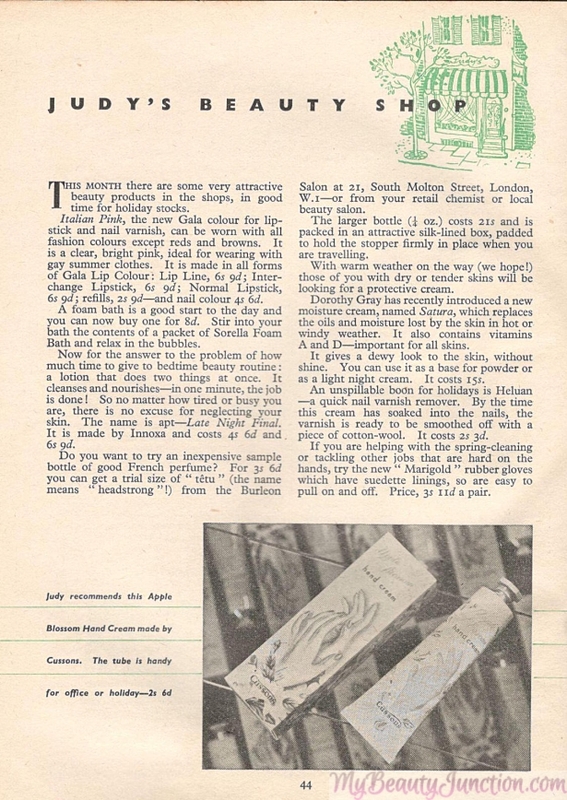 Makeup tips were regularly published; sometimes naming brands but without being advertorials. Max Factor, Rimmel, Yardley and Gala of London became popular across the British Commonwealth - my Mum wore Max Factor foundation to her wedding in the 1980s. Beautiful bobs (my Mum insisted on short hair for me until I was old enough to take care of it, and I kept it Diana-style until my Masters' was over), bold makeup looks... God, I LOVE this era and the early 80s, looks-wise. Natural makeup looks were also popular. However, these were bolder than today's no-makeup makeup look. A far bolder evening makeup look is shown in the slideshow further below. Can we ever forget Princess Diana's blue eyeliner? The glam-era was at its best through the Eighties. Here is a makeup look featuring green eyeliner and a combination of shimmery neutral eyeshadows. 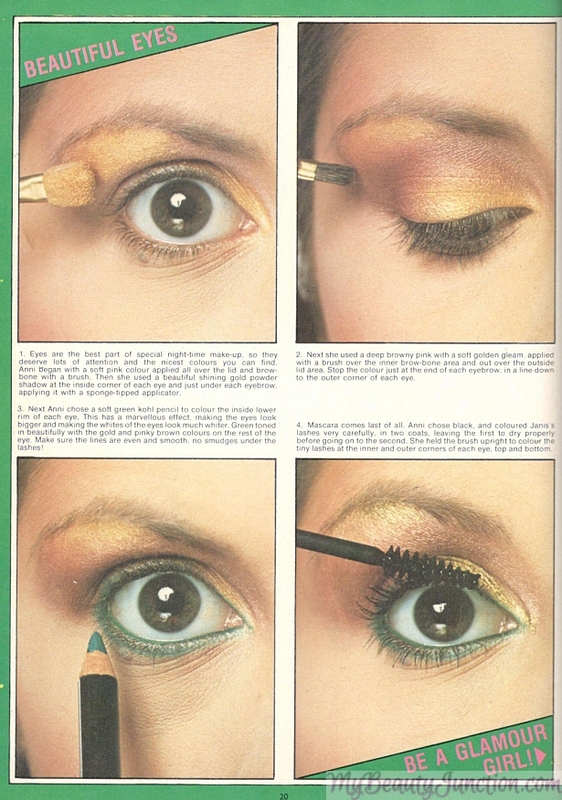 I would love to wear this look today, green eyeliner and all. 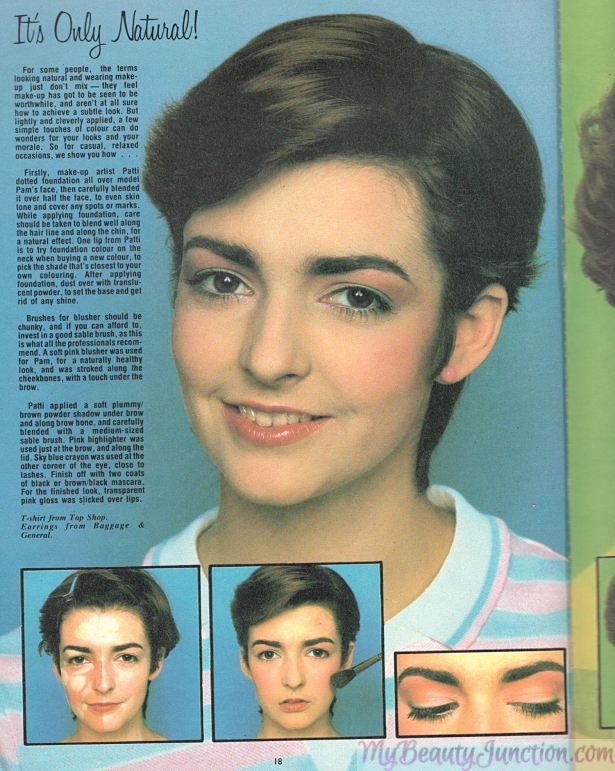 More 1980s beauty articles are in the slideshow below. There are just too many large photos already, so do watch the slideshow below for more beauty articles from vintage magazines. If you cannot see the slideshow, go here. Which of these was your favourite era? Why? Tell me in the comments below. 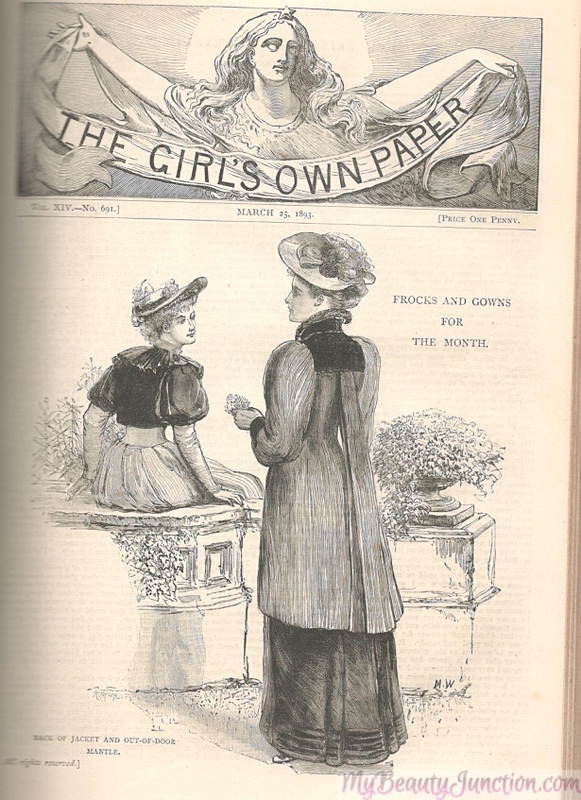 The Girls' Own Paper was a magazine from the Religious Tract Society, later Lutterworth Press. Incredibly popular throughout the British Empire, it was devoured by my great-great-gran (could be a 'great' more or less). Thankfully my entire family has the habit of hoarding, and I have about 40 or so of these. No introduction to Good Housekeeping is required. From my Gran's mother's hoard. Heiress magazine was my Gran's version of Cosmo, though more conservative. These are from my Mum's collection as a young adult/adult. For some reason, these are also my favourites. IMO the 80s look was great, makeup-wise. Eyebrows were not thinned within a millimetre of their lives; teeth were not whitened or straightened beyond a point; people had some facial hair and blemishes. And even weird, frizzy hair was fashionable. Did you like reading about beauty in the days gone by? Which of these was your favourite? Why? Tell me in the comments below.